The city of Curitiba reports approximately 2000 incidents of poisonous spider bites of the gender Loxosceles (brown spider) annually. The increase of these incidents occur due to the reduction of their natural predators, lizards, chicken and frogs because of the deforestations. Accidents are most common during the hottest times of the year (Spring and Summer). These spiders are very adaptable and may be active in temperatures ranging from 45 to 110 degree F.
They are soft bodied, yellowish-tan to dark brown, about 1/4 to 1/2 inch long and have long, delicate grayish to dark brown legs covered with few short, dark hairs. The leg span is about the size of a half dollar and does not make a web, but covers her nest with a sticky cocoon. Distinguishing characteristics are the presence of three pairs of eyes arranged in semicircle on the forepart of the head and a dark violin-shaped marking immediately behind the semicircle of eyes with the neck of the violin pointing towards the bulbous abdomen. She feeds on small insects, she is shy and has night habits, that is why it is difficult to find her during the day. They can often be found in dark and undisturbed places such as hiding in the folds of clothing (specially in the sweated parts), shoes, in the linen, underneath boxes in storage rooms, behind picture frames, under furniture and beds, behind books in libraries, behind closets, basements, attics and cellars, wall cracks, in cupboards, etc. Outdoors, the spider may be found in sheltered corners among debris, in wood or brick piles, under loose barks, in tree trunks and stones, in old barns, waste or refuse material, storage sheds and garages. 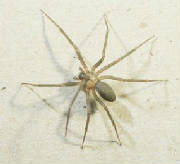 The bite of the brown spider is generally painless and many times people don't notice they have been bitten, as it is very common to be bitten while you are dressing and you lean the clothes against your body. The venom of the brown spider can cause serious cutaneous lesions, of varying degrees and both male and female are poisonous. The bites are most dangerous to children, the elderly, and those in poor physical conditions. May cause serious symptoms such as kidney and other organ failure, which can be fatal. The severity of a person's reaction to the bite depends on the amount of venom injected and individual sensitivity to it. Bite effects may be nothing at all, immediate or delayed. Some may not be aware of the bite for 2 to 8 hours, whereas others feel an itching, swelling and stinging sensation, usually followed by intense pain if there is a severe reaction. A small white blister usually rises at the bite site surrounded by a large congested and swollen area. Within 24 to 36 hours, a systemic reaction may occur with the victim, characterized by restlessness, fever, chills, nausea, weakness and joint pain. The affected area enlarges, becomes inflamed and the tissue is hard to touch. The spider's venom contains an enzyme that destroys cell membranes in the wound area with affected tissue gradually sloughing away, exposing underlying tissues. Within 24 hours, the bite site can erupt into a "volcano lesion" ( a hole in the flesh due to damaged, gangrenous tissue). The sunken, ulcerating sore may heal slowly up to 6 to 8 weeks. Full recovery may take several months and scarring may remain. Plastic surgery and skin grafts are sometimes required. The City of Curitiba trains medical staff specifically to deal with spider bites, and Parana State produces the antiloxoscelic serum (antidote) to use in serious accidents. If bitten, remain calm, collect the spider, if possible, for positive identification and get medical attention immediately (contact your physician, hospital and/ or Centro de Informa?ões Toxicológica -CIT - 0800-41-01-48. Apply antiseptic solution to prevent infection and ice packs directly to the bite area to relieve local swelling and pain. The anti-tetanic vaccine is also recommended. The following Health Centers have the best trained medical staff available for such cases. Caterpillars (in Portuguese known as lagartas or taturanas) are most prevalent during the summer months. They live for approximately 10 weeks, going through various phases of metamorphosis - only the caterpillar phase is considered to be harmful. The caterpillar measures 6-7 cm in length and the body is covered with short thorn-like bristles (similar to pine needles). They are usually light greenish-brown or yellowish-brown, with three longitudinal lines of dark brown. They also have one small irregular white spot around the third thoracic segment. They live in groups eating off leaves during the night. They resemble a type of parasitic tree fungus using the tree bark as a camouflage, they move in clusters to the lower trunk of the tree where they stay during the day. At the time of metamorphosis, they tend to stay near the dry leaves on the ground, thereby causing the most accidents. These caterpillars can be found on trees such as: Cedro, Figueira do Mato, Ariticum, Aroeiro and Ipé, and fruit trees such as: Plum, Pear, Peach and Avocado. They can live for 3-6 months depending on the food available and alterations in the climate. If you accidentally come into contact with the fuzzy hair of these caterpillars, you will feel a burning pain followed by redness, swelling, heat, a headache, nausea, and vomiting. Hemorrhagic manifestations can appear from 8 - 72 hours after contact, the most common being dark spots all over the body, bleeding from the nose, gums and recent wounds as well as in the urine. Severe cases can evolve into kidney failure and death. - Pay special attention to tree trunks and the area surrounding them including clotheslines. - Notice if there are butterflies, or droppings on the ground. - Use long sleeve shirts and pants during outdoor activities. Put the caterpillar in a ventilated container with leaves for identification. ** Be extra careful - using thick gloves, a pencil, a stick or any other long object.